Get paid what you’re worth. That’s my motto. We as professional creatives put way too much time, energy, heart and soul into what we do just to give it away. And one of the biggest mistakes I see professional creatives make (especially in the pro video world) is not charging enough for their work. So, it may seem confusing or even contradictory (dare I say “Hypocritical”) when I tell you that giving away your work should be part of your marketing strategy. The question is, when, why, and how to do it in a manner that supports your brand, and actually yields the results you want. Now, for purposes of this article, I am not going to talk about charity work. I think that is a very good way in fact to get your work out there and network with prospective clients. (Besides, I think it’s important to use your gifts to give back, regardless of whether or not there is any business reward). What I want to address specifically is when does it make sense to take on a “regular” gig for a past, present, or prospective client strictly for the purposes of helping your business. Here’s what inspired this post. A friend/colleague of mine was telling me about a job they did for someone who has a rather large following. They had done paid work for this person (not paid what they should have been given the scope IMHO) and now this person wanted to know if my friend/colleague would do another project for free. Ostensibly for the exposure. But here’s the thing. My colleague had already done enough work for the high profile person that any benefit they would have received from that exposure would have kicked in already. Add to the fact that many other creatives in my colleague’s industry had also done a number of freebies for this individual such that my colleague would just be one of any number of people looking to get exposure. 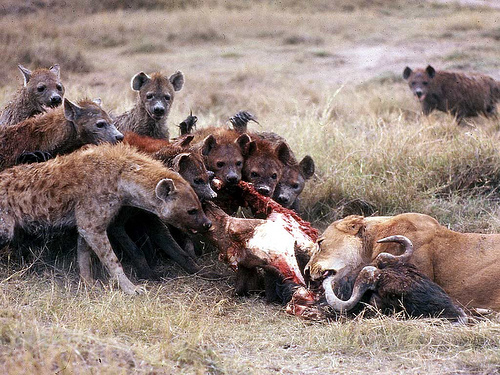 I kind of liken it to vultures or hyenas that follow a tiger or lion around to get its scraps after the kill. I’ve seen it happen time again. Creative professional does free work for celebrity in hopes of exposure. At some point creative professional wants to get paid for his/her work for said celebrity. Said celebrity moves on to the next creative professional willing to work for free. But at some point the creative professional needs to know when he/she has reached the point of diminishing returns from that free work. So, here are some things I’ve learned over the years as to when it makes sense to do work for free. Exposure. As I mentioned earlier, the main reason you may do work for free is because it will give you a tremendous amount of exposure. I mentioned in a previous post how in 2007 we did the first recap video for WPPI’s annual conference. I did it for free. And the working relationship I had with them over the years doing those “free” gigs paid off. In some cases it lead to actual paid gigs for WPPI sponsors where we got the gig because we were going to be there shooting video anyway. But in general, it lead to us getting lots of exposure to an industry for which we started to build a brand as a go-to company for video work. We were new to that industry so it was mutually beneficial. The trick when doing work for exposure purposes is knowing when you’ve gotten all you can expect to get out of the “free” work and it’s time to starting actually getting paid. Sometimes that high profile client will hire you for future gigs. Sometimes they won’t. To build your portfolio. One of the first times you may do work for free is when you’re just starting out. You know you need something to show prospective clients, so you may have to do a few jobs for free (or really cheap) in order to build up a portfolio of work to show. The question you need to answer in this case is “When am I ready to start charging?” The answer to that depends on you. If you do an amazing job for free, let’s say a video or photo shoot that looks like it costs $50,000, assuming you have good sales skills, there’s no reason why on your next job you couldn’t charge $50,000. If the value is there, the clients who recognizes it and needs it will pay it. (The hard part is finding them, but that’s fodder for another blog post). Connections. You may want to do a job for a client for free because the relationship with that client will give you connections you would never get otherwise. The caveat here is to make sure you are confident those connections will really pan out. Don’t go into such a job assuming the client will connect you to whomever you want to be connected. You either need to have a high level of trust that they will deliver on any promises to hook you up with whomever you want to be hooked up with, or you need to build into your contract that you get what you want. This one is kind of tricky because often times the connections you think will be so great really aren’t. You need to decide that for yourself. Bragging rights. It may be worthwhile to do a gig for free just to have that client on your client list. To be able to say you “shot so-and-so’s” wedding, or you did a music video for so-and0so, can be a huge selling point for your business. Just as important as knowing when it makes sense to do a job for free, is knowing when you shouldn’t. In fact, you could argue that’s more important. Basically, if you cannot definitively and objectively quantify what your business will get out of a freebie (e.g. large exposure to an audience that does not already know you, adding work to your portfolio that is unlike anything you’ve ever done, etc.) then chances are, you should not do it. Even if you can quantify the business reward, there may be extenuating circumstances like how that job will affect your family life; what the personality of the client is like and if their disposition is something you can stand; what effect will it have on your health; do you get to have the right to use the work in promotions (doing work for a “real” Hollywood celebrity could come with limitations that make doing it for free not at all worth it). All of these must be taken into consideration. Lastly, if you decided to take on such a gig, don’t skimp on the quality just because you’re not getting paid in dollars. Put all the heart and soul you would normally put into it had the client paid you financially. Your reputation and integrity are not worth sacrificing. So if you can’t do such a job at the highest possible level, just don’t do it at all. You’ve taught me so much in this area already as I was starting my own business. Much appreciated brother. Keep sharing the knowledge.